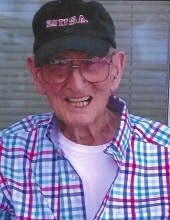 Carroll, Marvin Leo - Age 86, of Swartz Creek, died April 11, 2019 in Florida. Funeral services will be held 1 PM Thursday, April 18, 2019 at Swartz Creek Church of Christ, 4410 Seymour Road, Swartz Creek, John Cox officiating. Visitation will be 1-4 and 6-8 PM Wednesday, April 17 at Sharp Funeral Home and Cremation Center 6063 Fenton Road, Flint and from 12 until the time of the funeral Thursday at church. Interment will be at Crestwood Memorial Cemetery, Grand Blanc. Marvin was born June 22, 1932 in Malden MO the son of William C. and Irene (Rowland) Carroll. He was the oldest of five children and two half-brothers. He served in the Korean War as a materials driver to the front lines. Upon discharge he moved to Flint to find a job at General Motors. After 31 years he retired as a truck driver. Marvin married Nannette Odell and they had six children. He became very active in the Church of Christ during this time. He was very passionate about his faith. After Nannette died he met and married Lynne Parenteau. She was a kindergarten teacher and he was her "Homeroom Father." He also was Santa Claus to her Mrs. Claus. After Lynne's retirement they moved to Florida to continue their spreading of God's Word. Marvin was a missionary for the Church of Christ in Panama for ten years. He was a handyman and teacher to boys 10-12 years of age. After leaving missionary work Marvin settled down to work at home and travel. He had a wonderful life. God truly blessed him. Marvin became very ill and after over a year he passed away. Surviving are: wife Lynne; four sons, Gary Carroll of Caro, MI, Andrew Carroll (Melissa) of Akron, OH, David Parenteau of Clio, Michael (Annette) Parenteau of Gwinn, MI; 16 grandchildren; 30 great-grandchildren; two half-brothers, Robert (Debbie) Rigsbee, Thomas Rigsbee; many nieces and nephews. He was preceded in death by his parents; wife Nannette; sons, Thomas and Dennis; daughters, Lisa and Colleen; sisters, Joan, Mary Ellen, and Patricia; and brother Jerry. Tributes may be shared at www.sharpfuneralhomes.com. To send flowers or a remembrance gift to the family of Marvin Leo Carroll, please visit our Tribute Store. "Email Address" would like to share the life celebration of Marvin Leo Carroll. Click on the "link" to go to share a favorite memory or leave a condolence message for the family.